In just over a week, the sports world will direct its attention to Baltimore, to see if Kentucky Derby-winner American Pharoah can capture the second jewel of the Triple Crown. 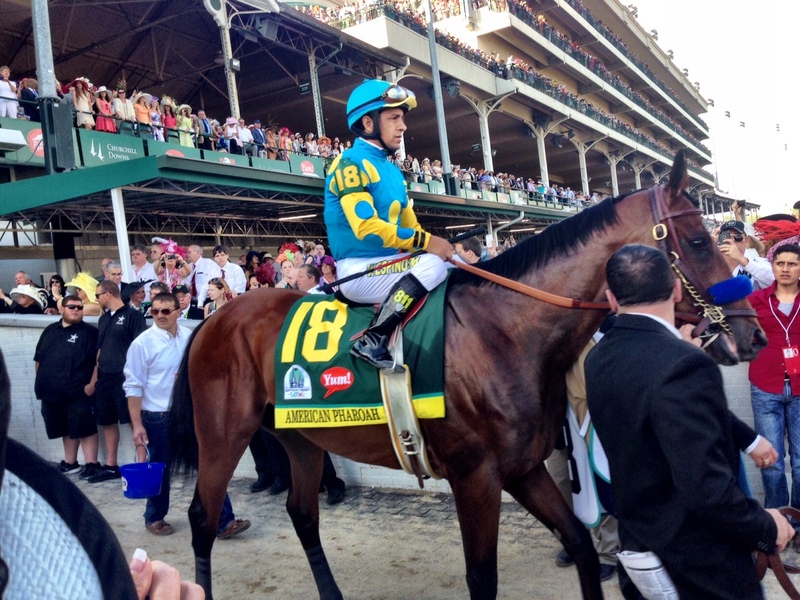 A May-16 Preakness victory for American Pharoah would keep hopes alive for the first Triple Crown winner since 1979. The third jewel of the Triple Crown is the June-6 Belmont Stakes in New York. Jockey Victor Espinoza and American Pharoah taking the Churchill Downs dirt, minutes before their Kentucky Derby victory (John Cox photo). While we don’t know exactly how many runners will show up to challenge the Kentucky Derby presented by Yum! Brands-winner, we do know that Derby runner-up Firing Line and third-place Derby finisher Dortmund have been penciled in to play spoiler next Saturday. It will be interesting to see if Pat Day Mile-winner Competitive Edge will enter the Preakness and potentially add a new element of speed to the field for trainer Todd Pletcher. The Pat Day Mile was the longest distance covered for the undefeated Grade-1 winner, but Pletcher hinted after the latest win that he thinks Competitive Edge has what it takes to compete going further. Competitive Edge is one of three possible Preakness contenders for Pletcher, along with Materiality (6th in the Kentucky Derby) and Carpe Diem (10th in the Derby). John Velazquez rode Carpe Diem in the Derby and Competitive Edge in the Pat Day Mile, so if both horses are entered in the Preakness, fans and gamblers will be watching closely to see who Johnny decides to ride. Horse racing hasn’t always had this type of coverage, so we are encouraged to see NBC Sports’ continuing commitment to Thoroughbred racing in providing us with 7.5 hours next weekend. There will be a full two-hour Preakness show on the main NBC Network from 4:30-6:30 p.m. next Saturday. 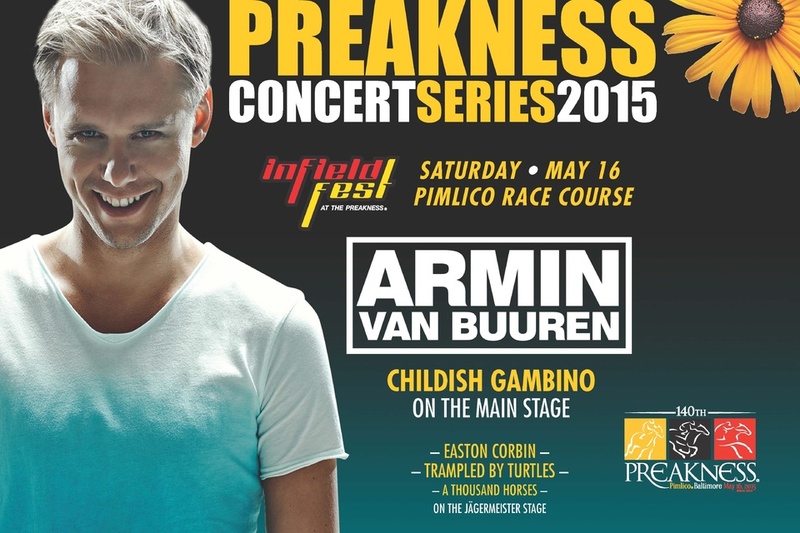 I’m not that familiar with Armin Van Buuren, but if he’s highlighting the Preakness Infieldfest, he has to be pretty big. For years, fans have consistently talked about the craziness of the infield at the Kentucky Derby. I would argue that over the last five-to-seven years, the Preakness has taken over the title for wildest infield party. There was a time when Churchill Downs experimented with bringing in some recognizable music acts, but they ultimately conceded that their infield is a big enough party without having to spend all that money bringing in big names. Since 2008, the Preakness’ InfieldFest has attracted party music monsters like Bruno Mars, Maroon 5, Pitbull, Lorde, Nas, Macklemore & Ryan Lewis, Wiz Khalifa, and many more. For 2015 InfieldFest ticket information, click here.